K-Jon’s Fifth Annual Ladies Night is a success. Recently, California jewelry store and authorized Novell wedding band retailer K-Jon’s Fine Jewelers held their 5th Annual Ladies Night. The charity event raised awareness for both The Susan G. Komen Foundation and Hospice Partners of The Central Coast. 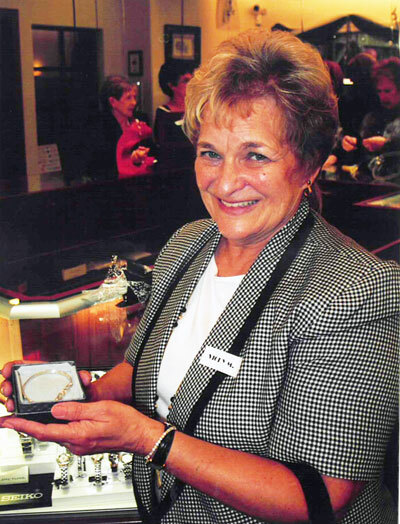 Novell donated handmade “love knot” bracelets, which are specially created with Argentium Sterling Silver. Congratulations to K-Jon’s for hosting such a successful evening for worthy causes. Showing off Novell's "love knot" bracelet. 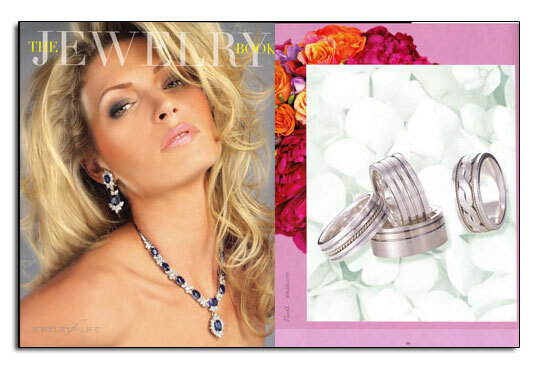 Novell wedding bands featured in National Jeweler. A recent issue of National Jeweler featured new Novell wedding bands specially created in Argentium Sterling Silver. 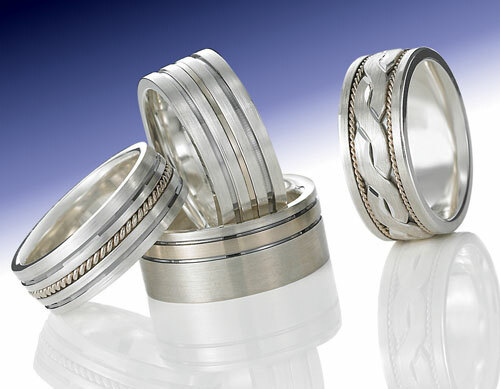 Wedding bands created with Argentium Sterling Silver are durable, affordable and resistant to tarnish. Argetium Sterling Silver wedding bands as featured in National Jeweler. Argentium Sterling Silver wedding bands in the December 2008 issue of National Jeweler. The December 2008 issue of National Jeweler featured new Novell wedding bands specially created in Argentium Sterling Silver. Wedding bands created with Argentium Sterling Silver are durable, affordable and resistant to tarnish. Argentium Sterling Silver wedding bands as featured in National Jeweler. Platinum wedding bands featured in JQ Magazine. 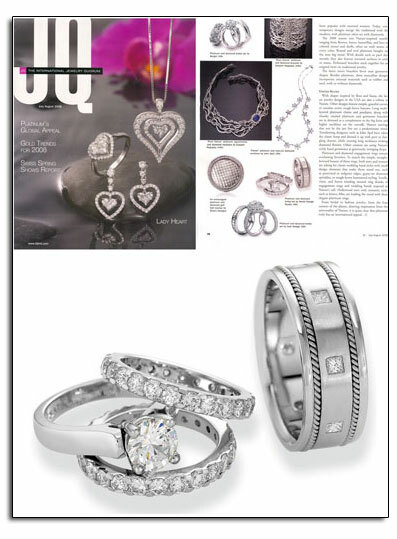 The July/August 2008 issue of JQ Magazine featured Novell platinum wedding band and engagement ring styles PE2347-LA, P1892-3LCC and P1815-8GCC in the article Platinum’s International Appeal. 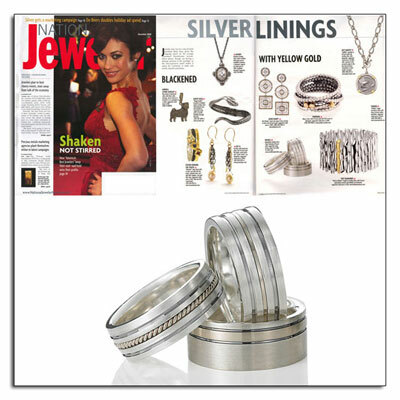 Novell platinum wedding bands as featured in JQ Magazine. Argentium Sterling Silver wedding bands in The Jewelry Book. 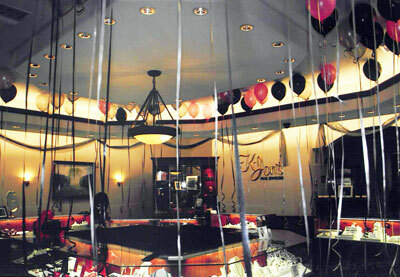 The Summer 2008 issue of The Jewelry Book featured brand new Novell wedding bands that are manufactured using Argentium Sterling Silver and 18kt gold. This product was recently introduced at the 2008 JCK Show in Las Vegas. The styles are (from left to right) – AS1974-8GEW, AS1971-9GEW, AS1977-9GEW and AS1978-9GEW. Argentium Sterling Silver wedding bands as featured in The Jewelry Book. 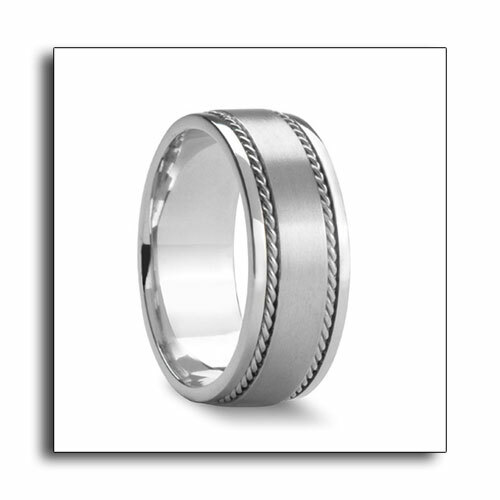 Novell introduces weddings bands created with Argentium Sterling Silver. 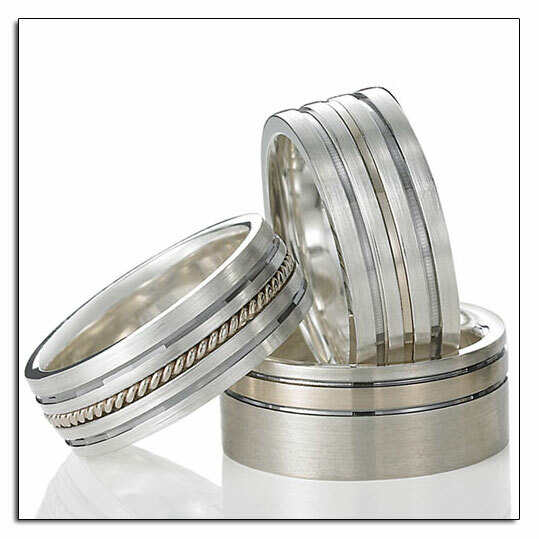 Why choose Argentium Sterling Silver for your wedding band? • Novell uses Argentium Sterling Silver that is 95% pure. • Argentium Sterling Silver stays bright and beautiful for years. • Argentium Sterling Silver is highly tarnish resistant – so its shine is long lasting. There is no need for additional professional polishing or excessive care. Warm water and a mild detergent are all that are required to maintain its appearance. Smudges can easily be removed by using a soft dry cloth only. • It is a “green” metal – friendly to the environment. Chemicals are not required to correct potential fire scale (or fire stain) damage to metal which sometimes occurs when metals are heated during the manufacturing process. New from Novell – Argentium Sterling Silver wedding bands.